Davinson Sanchez has revealed that he turned down the opportunity to head for Camp Nou before linking up with Ajax. 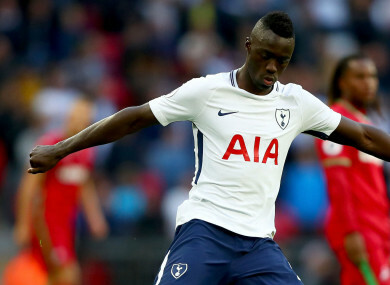 DAVINSON SANCHEZ HAS revealed that he turned down the opportunity to join Barcelona before linking up with Ajax and registering on Tottenham’s radar. The highly-rated defender was a man in demand last summer after enjoying a breakthrough year in Amsterdam. Having spent just 12 months in Europe following a switch from Atletico Nacional in his native Colombia, the 21-year-old was acquired by Spurs in a £42 million deal. He is now gracing Premier League and Champions League stages, but admits that he could have been on the books at Barcelona had he opened himself up to interest from Catalunya in the summer of 2016. Sanchez told Marca on his career path: “It’s true that I was always linked [with Barcelona]. There was an offer on the table, but you have to think about the conditions. “I had just won the Libertadores and had to go to Barcelona’s second team. Having previously snubbed a switch to Spain, Sanchez also claims to have spurned the opportunity to head for Serie A after speaking with Spurs head coach Mauricio Pochettino. He added: “The first person I spoke with was Pochettino and I had the chance to go to Italy, but Mauricio convinced me. “He was a central defender and I feel I can trust him, as what he wants from me seems very reasonable. Sanchez is now looking to make his mark in England, while a fellow Colombian has joined the ranks at Barca in the form of Yerry Mina. The 23-year-old has opted to embrace the fierce competition for places at Camp Nou, rather than ease his way into European competition elsewhere, with an international colleague backing him to make a positive impression in La Liga. Sanchez said of Mina: “He deserves everything that is happening to him and he has the ability to play at Barcelona because he has a lot of quality. He knows how to play the ball and he takes advantage of his height and has scored many goals. Email “Tottenham defender admits to having snubbed Barcelona switch”. Feedback on “Tottenham defender admits to having snubbed Barcelona switch”.